Author(s): Beatrice Conti, Katherine K. Slemmons, Rossella Rota, Department of Oncohematology, Laboratory of Angiogenesis, Faculty of Ospedale Pediatrico Bambino Gesu‘ , IRCCS, Piazza S. Onofrio, CAP 00165, Roma, Italy. Corinne M. Linardic. Division of Pediatric Hematology- Oncology, Department of Pediatrics, Duke University School of Medicine, Box 102382 DUMC, Durham, NC 27710, USA. The Notch signaling pathway is an evolutionarily conserved developmental network critical for embryonic and postnatal regulation of tissue growth, homeostasis, and repair. Signaling is initiated when transmembrane Notch ligands bind to transmembrane Notch receptors on nearby cells. Sequential proteolytic steps generate an activated Notch fragment that translocates to the nucleus, where it drives activation of canonical Notch target genes. In skeletal muscle, Notch signaling governs myogenic cell fate and stem cell maintenance. In the human soft tissue sarcoma rhabdomyosarcoma, which bears markers of skeletal muscle commitment and so is thought to be related to the skeletal muscle lineage, Notch signaling is also found to be upregulated and dysregulated. This review provides an overview of Notch signaling during normal embryonic and postnatal myogenesis, information on the recently discovered aberrant Notch signaling occurring in muscular dystrophies, the upregulation and mechanism of Notch signaling in the embryonal variant of rhabdomyosarcoma and related soft tissue sarcomas, and Notch cross-talk with other metazoan developmental pathways including Hippo, Hedgehog, Wnt, and TGF-β. The review concludes with updates on current promising efforts to target and inhibit Notch signaling in human sarcomas including rhabdomyosarcoma. Keywords: Notch, embryonal rhabdomyosarcoma, skeletal muscle, myogenesis, muscular dystrophy, targeted therapy, pediatric cancers. Affiliation:Department of Oncohematology, Laboratory of Angiogenesis, Faculty of Ospedale Pediatrico Bambino Gesu‘ , IRCCS, Piazza S. Onofrio, CAP 00165, Roma, Italy., Division of Pediatric Hematology- Oncology, Department of Pediatrics, Duke University School of Medicine, Box 102382 DUMC, Durham, NC 27710, USA. Keywords:Notch, embryonal rhabdomyosarcoma, skeletal muscle, myogenesis, muscular dystrophy, targeted therapy, pediatric cancers. Abstract:The Notch signaling pathway is an evolutionarily conserved developmental network critical for embryonic and postnatal regulation of tissue growth, homeostasis, and repair. Signaling is initiated when transmembrane Notch ligands bind to transmembrane Notch receptors on nearby cells. Sequential proteolytic steps generate an activated Notch fragment that translocates to the nucleus, where it drives activation of canonical Notch target genes. In skeletal muscle, Notch signaling governs myogenic cell fate and stem cell maintenance. In the human soft tissue sarcoma rhabdomyosarcoma, which bears markers of skeletal muscle commitment and so is thought to be related to the skeletal muscle lineage, Notch signaling is also found to be upregulated and dysregulated. 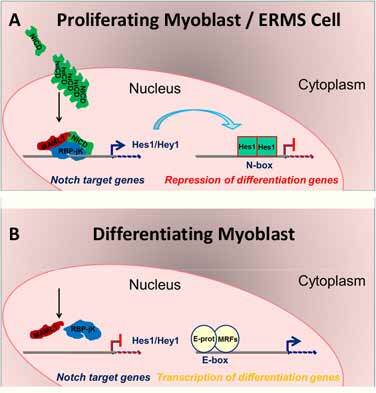 This review provides an overview of Notch signaling during normal embryonic and postnatal myogenesis, information on the recently discovered aberrant Notch signaling occurring in muscular dystrophies, the upregulation and mechanism of Notch signaling in the embryonal variant of rhabdomyosarcoma and related soft tissue sarcomas, and Notch cross-talk with other metazoan developmental pathways including Hippo, Hedgehog, Wnt, and TGF-β. The review concludes with updates on current promising efforts to target and inhibit Notch signaling in human sarcomas including rhabdomyosarcoma.